Cotton Sleeping caps, available in a blue or maroon cotton check. Features 1.5" cotton ticking band, and a 100% wool tassel at the top. Visible seams are handsewn. Available in all sizes. 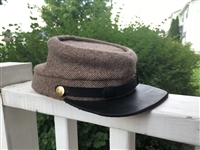 Confederate Kepi, patterned off of an original confederate cap in a private collection. Constructed with antique coarse gray wool, very similar to that seen on some original confederate caps. Pictured with Iron dyed leather brim, functional leather chinstrap, and pigskin sweatband. These caps are custom made to order. The standard cap features hand top stitching on the outside, a leather visor and nonfunctional chinstrap, a quilted lining that includes period machine stitching, and a pigskin sweatband. Linings are available in a variety of materials, included several cotton prints, cotton homespuns, and polished cottons, and the visor and chinstrap are available in natural, enameled black, and iron dyed black.. Contact us for more customization options.